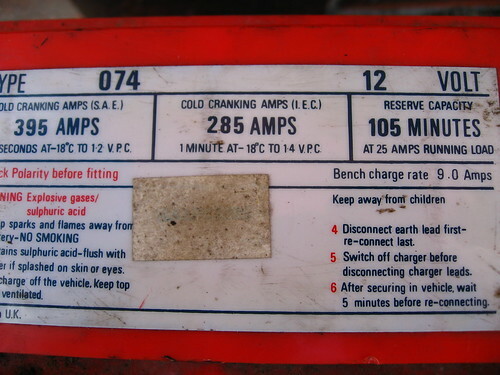 This is the battery we took out of the MG - no idea if it's the original or not. We needed to get a replacement with as near as possible dimensions to this one as the battery bin is cramped at the best of times. UniPart luckily had a battery identical to this. Getting this one out was a struggle. The MG battery bin is under the back seat with little or no room to get your hands around it to lift it. When I put the new one in I made sure to strap it to make it easier next time.